Description: CSXT 6118, 8236, 4301 & 9728 are seen on a WB CSX freight as it passes the tower at Viaduct Jct in Cumberland, MD. Description: CSXT 8236 is seen at Cumberland, MD. Unit is ex SBD 8236/L&N 3608. Description: HLCX 6520 and CSX 8236 Sitting in the NYSW Engine Terminal. Description: HLCX 6520 and CSX 8236 are on the NYSW fuel track at Ridgefield Park, NJ 8/18/1999. 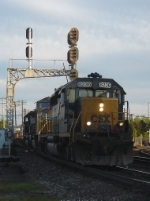 Description: CSX 8236 is on the point of Q-271 at Ridgefield Park, NJ 8/8/2004. Description: On the C&O east to the B&O main. Description: CSX Q326 rolls east across Harrison road after working the yard in Lansing. Description: A stack train passes under the C&O signal. Description: Some CSX Power takes UP Train QASLI 11 past some flowers along Dunklin County AB Highway, reminding me that it's still spring and it's already 90 degrees. Description: A new signal has replaced this one and it is turned awat from track to show it is out of service. Description: not to be refueled, so probably not pulling. Description: CSX 8551 leads Q305 that consists of only 5 cars today. Description: CSX SD40-2 8236 trails on Q573 South.